You can add people with bios, pictures and contact information. They can optionally be placed into groups such as staff, deacons, etc. First create a page that will list all people. Under Page Attributes, set Template to “People”. Optionally organize people into groups such as staff, deacons, etc. You can then use a widget in the People Sidebar (if available with your theme) to list the groups or link to them from your menu. Go to People > Groups. Complete the form to add a group. There is a People column with a number by each entry. This shows you how many people are in each group. If you click the number, it will show you the people. You can manually control the order of groups with this plugin. Go to People > Add New. Write a bio for the person. Fill in their details under Person Details. Optionally select or add the Group that this person belongs to. Optionally click Featured Image to upload a portrait of the person. Enter a short description for the profile in Excerpt. Hover over a person to see the Edit and Trash options. People are listed in manual order. There is an Order field that you can enter a numeric value into when adding or editing a person. You can use a plugin like Post Types Order for easy drag-and-drop ordering of people. Go to Appearance > Customize > Widgets to add people-related widgets to your theme’s widget areas. There are a couple widgets especially useful for people. 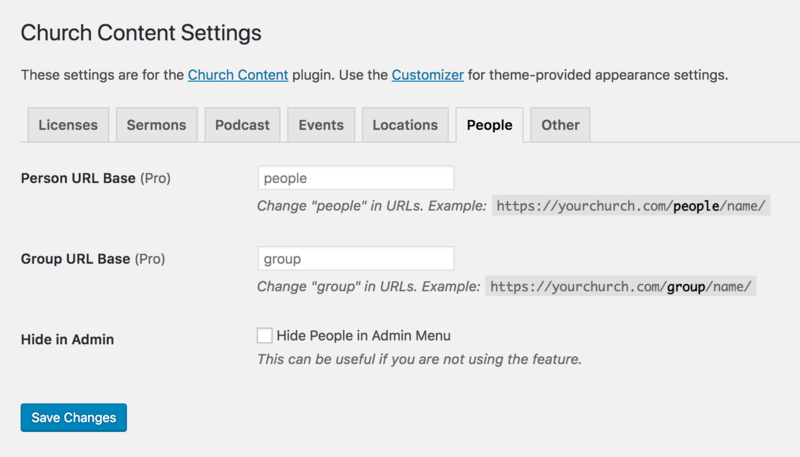 There are settings available in Settings > Church Content > People. You can also change the number of people shown per page.